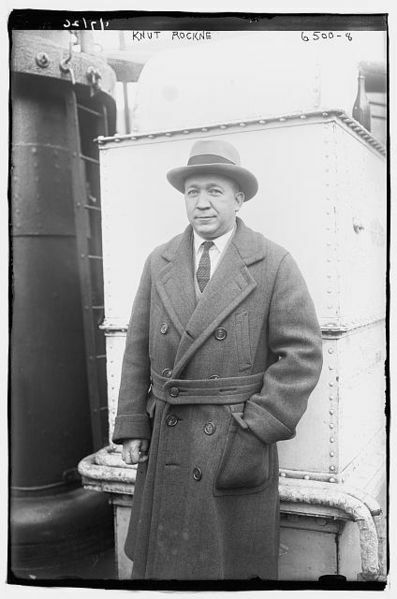 Knute Kenneth Rockne (March 4, 1888 – March 31, 1931) was an American football player and coach. He is regarded as one of the greatest coaches in college football history. His biography at the College Football Hall of Fame calls him "American football's most-renowned coach." He was a native Norwegian and was trained as a chemist at the University of Notre Dame, where he later coached. He is credited with popularizing the use of the forward pass. Knute Rockne was born Knut Larsen Rokne in Voss, Norway to the smith and wagonmaker Lars Knutson Rokne (1858–1912) and his wife Martha Pedersdatter Gjermo (1859–1944). He emigrated with his parents at five years old to Chicago. He grew up in the Logan Square area of Chicago, on the northwest side of the city. Rockne learned to play football in his neighborhood and later played end in a local group called the Logan Square Tigers. He attended North West Division High School in Chicago playing football and also running track. After Rockne graduated from high school, he took a job as a mail dispatcher with the Chicago Post Office for four years. When he was 22, he had saved enough money to continue his education. He headed to Notre Dame, Indiana, to finish his schooling. He graduated from Notre Dame in 1914 with a degree in pharmacy. After graduating he was the laboratory assistant to noted polymer chemist Julius Arthur Nieuwland at Notre Dame and helped out with the football team, but rejected further work in chemistry after receiving an offer to coach football. During 13 years as head coach, Rockne led his "Fighting Irish" to 105 victories, 12 losses, five ties, and three national championships, including five undefeated seasons without a tie. 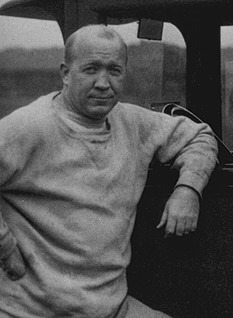 Rockne posted the highest all-time winning percentage (.881) for an American football coach, college or professional. His players included George 'Gipper' Gipp, the "Four Horsemen" (Harry Stuhldreher, Don Miller, Jim Crowley, and Elmer Layden), Frank Thomas, Frank Leahy, and Curly Lambeau. Rockne introduced the "shift", with the backfield lining up in a T formation and then quickly shifting into a box to the left or right just as the ball was snapped. Rockne was also shrewd enough to recognize that intercollegiate sports had a show-business aspect. Thus he worked hard promoting Notre Dame football so as to make it financially successful. He used his considerable charm to court favor from the media, which then consisted of newspapers, wire services and radio stations and networks, to obtain free advertising for Notre Dame football. He was very successful as an advertising pitchman, for South Bend-based Studebaker and other products. Rockne died in a plane crash in Kansas on March 31, 1931, while en route to participate in the production of the film The Spirit of Notre Dame. Shortly after taking off from Kansas City, where he had stopped to visit his two sons, Bill and Knute Jr., who were in boarding school there at the Pembroke-Country Day School, one of the Fokker Trimotor aircraft's wings separated in flight. The plane crashed into a wheat field near Bazaar, Kansas, killing Rockne and seven others. President Herbert Hoover called Rockne's death "a national loss." Rockne was buried in Highland Cemetery in South Bend.